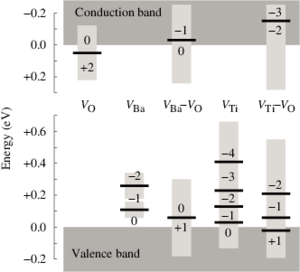 The defect structure of hard copper-modified polycrystalline PbTiO3 ferroelectrics is investigated by means of electron paramagnetic resonance and hyperfine sublevel correlation spectroscopy, as well as density functional theory calculations. Special emphasis is put on the 207Pb-hyperfine couplings, which are resolved up to the third coordination sphere. The results prove that copper is incorporated at the octahedrally coordinated Ti site, acting as an acceptor. 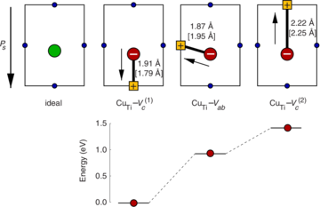 Because of charge compensation the formation of Cu impurity-oxygen vacancy pairs is energetically very favorable. The corresponding (CuTi’‘[prime][prime]’’-VO..)x— defect dipole is found to be orientated along the  axis.